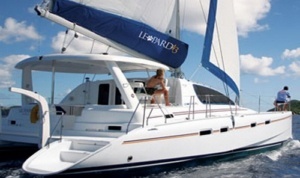 Leopard Catamarans is well known in the boating world for their quality designs and manufacturing. And their 43 Powercat is no exception.Outstanding details went into every aspect of conception for this incredible catamaran as seen in the hull, interior, and everywhere else on the boat. Experienced builders Robertson and Caine are responsible for the bones of the vessel and the exterior design is the work of noted design company Simonis Voogd Design. Some might think of the Powercat 43 as the upgraded version of the 39 Powercat. But it is its complete replacement, ranking high in Catamaran Reviews. 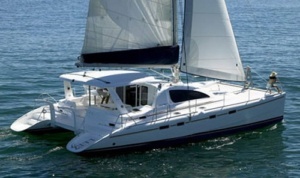 This mid-sized catamaran is brilliantly designed with a stepped hull that allowed the manufacturers to increase the interior space above the waterline. This permit cruisers to have a more open layout in the hulls without decreasing the yacht’s performance. There are noticeable upgrades with the slender hulls and reduction in wetted space below the waterline. Naval architect Phillipe Subzero drew the hull lines for the Powercat 43. Subzero is a famous catamaran designer who specializes in passenger style formation. The hulls he drew were designed to maintain a level position and augment clear sea passages. His ideas were perfect for a yacht that speeds along between twelve and twenty-four knots, depending on the owner’s choice of engines. The 43 Powercat can reach twenty-four knots without compromising on fuel efficiency.This yacht has a sizeable flybridge that includes a wet bar.Grill, and access to the sunbathing area that can seem straight ahead. The interior galley is located forward.And the settee and table are located aft. This ingenious design lets cruisers have a panoramic view of the outside. Those on board can relax in the aft cockpit seating area and see out the sliding glass doors in front of the settee. A huge window and access door to the bow can make the inside feel more like outside without subjecting cruisers to the elements. The makers of the Leopard 51 Powercat decided that after its completion there needed to be improvements made in the efficiency of the hull. They invested in a testing program inspired by the Powercat 51. At the conclusion of their experiments, Leopard was able to develop a yacht that can achieve speeds comparable to the Powercat 51, even though it uses two hundred twenty less horsepower and is eight feet shorter. The usable space on board may remind catamaran enthusiasts of the Leopard Powercat 40. The flybridge area is close to what buyers will get from the Powercat 51, and the interior volume is thirty percent larger than what they would get from the Powercat 39. The beam of the Powercat 43 measures twenty-two feet and one inch. The LWL is forty feet and ten inches. The draft is three foot and one inch, and the LOA is forty-two feet and eight inches. The Leopard PC 43 uses 2 two hundred twenty horsepower motors to power itself through the water. The fuel tank can hold two hundred sixty-four gallons. Some features can be designed according to the owner’s wishes. There can either be six or eight berths and three or four cabins depending on the boater’s preference. There are two heads and two showers. The maximum load capacity on board the Powercat 43 is eleven thousand twenty-three pounds.And its displacement weight is twenty-five thousand seven hundred ninety-four pounds. The waste tank can hold up to twenty-four gallons. The catamaran’s water tank can hold two hundred six gallons. 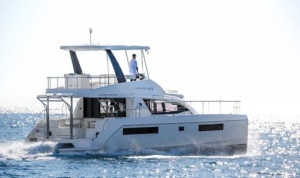 Favorite blogs and forums that feature Catamaran Reviews from real life yacht enthusiasts reveal an overall satisfaction from purchasers of the Leopard Powercat 43. There was almost nothing negative to report from those who have gone cruising on board the vessel. One thing that did deter some catamaran shoppers from buying the Powercat 43 is the balsa coring.Some luxury boaters will not purchase a ship if it is filled with any balsa below the water level. Balsa has a bad reputation among some cruisers for being prone to damage and hard to maintain. Owners of the Leopard Powercat 43 feel that the balsa is no issue because it is high quality. No Catamaran Reviews so far indicate an owner was having trouble maintaining the balsa. What owners are most satisfied with is the speed they get out of the 43 PC. Most catamarans of similar size using similar engines use much more fuel and are significantly slower.